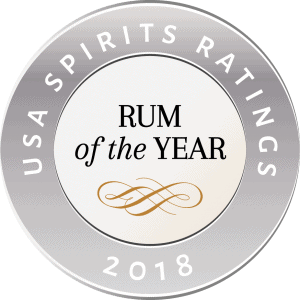 Voted 2018 Rum Of The Year! The judging process at the USA Spirits Ratings competition, which is hosted by Beverage Trade Network, is fundamentally different from that found at similar types of events around the world. While the rating system uses a 100-point scale, it assigns points for Quality (out of 50 possible points), Value (out of 25 possible points) and Packaging (out of 25 possible points). Gold Medal winners are those that score 90 or higher points out of 100; Silver Medal winners are those that score 80-89 points out of 100, and Bronze Medal winners are those that score 70-79 points out of 100.